Phenology and Nature’s Notebook can also be used to teach subjects other than science. Adding a phenological monitoring program to your classroom is easy as long as your project is well-planned. Consider involving other like-minded teachers and staff in your project to make it a meaningful, multi-year experience. Use Nature's Notebook observations to teach many science topics and prepare students for higher education by exploring critical thinking, careers, research, and scientific inquiry. Have students monitor a set of plants for a semester, or a year. Ask them to generate their own hypotheses, based on evidence of what they've seen, about seasonal and climatic change. If you and the students can continue monitoring for multiple years, ask students to return to the Nature's Notebook data, via visualization tools or excel download, and synthesize what they've seen and learned over the course of their high school career. We encourage people to create groups for monitoring at your school or campus, to which many participants can contribute their own observations. Consider reaching out to community agencies and organizations and asking them to also monitor phenology. Many local and state government agencies have staff that will help with outreach projects and engage high school students in career choices. Even better if the theme can be phenology! Have ideas or curriculum to share? Let us know and we can post it! If you can't commit to a long-term monitoring program at your school, consider instead using some of our phenology activities and lesson plans to supplement your student learning. Search the table below for activities appropriate for high school learners. The table below contains lesson plans and ideas for implementing Nature’s Notebook in Grades 9-12. Implementing phenology monitoring and Nature’s Notebook at the high school level allows students to engage with the content in an experiential way, provides opportunities to do community based projects through partnerships with local organizations, understand the implications of climate change, and engage with scientists performing data analysis. 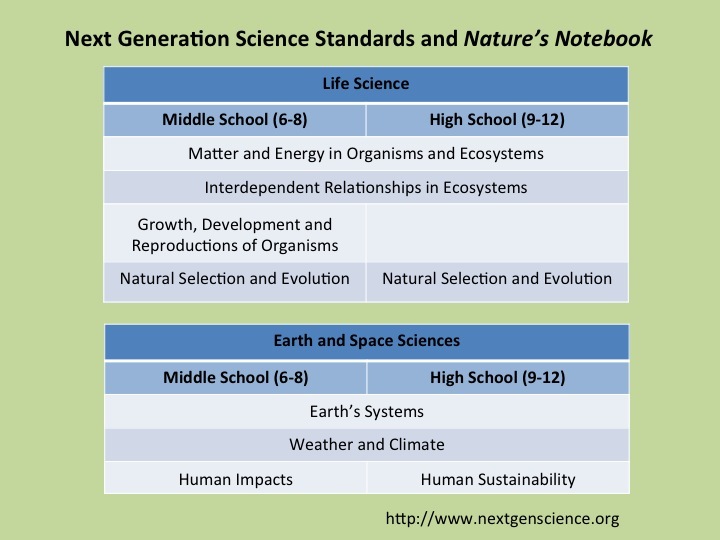 View Nature's Notebook curriculum materials developed for 9th-12th grades in the table below.